Success starts with self-love. Money doesn’t hurt either. But for an insecure person, self-love is crucial. This guy really loved himself because he knew he was deadly. Hasn’t he just signed a rookie contract with the Detroit Red Wings hockey club? He’s back home in Saskatchewan, one of the weirdest names in one of the weirdest places in the world. It’s really good, and so is he, and he’s back home, for a bit, that spring and summer, visiting family and friends and driving around in his new convertible. He takes these two girls for a ride. One is his younger sister, the other is his younger sister’s friend. And he gives his younger sister’s friend this picture, and years later she gives it to me. I saw him live once. I was in Peterborough Ontario Canada when, having already filled my diaper, I wasn’t all that interested in Gordie Howe or his autograph, or that of Alex Delvecchio, or Terry Sawchuck. But I knew it was the Detroit Red Wings playing a charity contest against the Peterborough minor hockey team. Howe always knew that if he got into a flow of creativity and backed it up with physicality, personal beautiful handsomeness, skill, and maybe a new pair of skates it’s going to be really, really good. 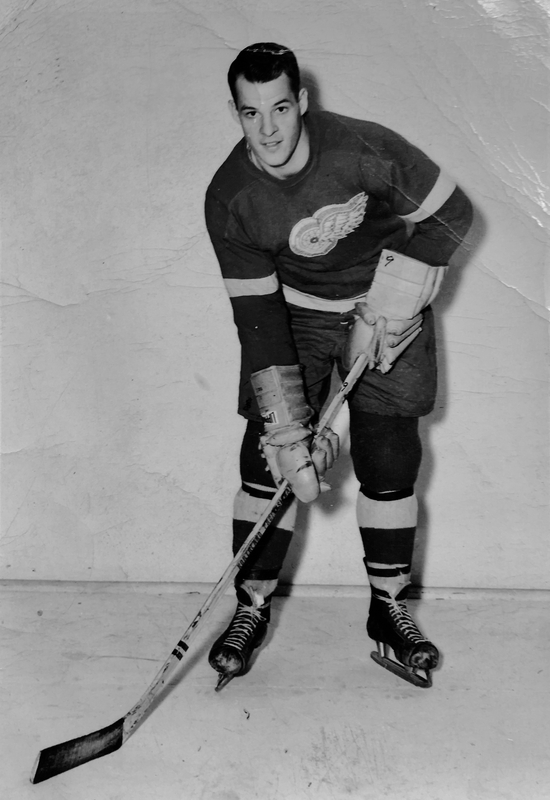 This entry was posted in Absurdities, Certainties and tagged 1949, Detroit Red Wings, Gordie Howe, Saskatchewan. Bookmark the permalink. I of course was his sister Joan’s friend. Gordie took us for a ride in his new car down around the dam in Saskatoon a long way from where they lived out by the exhibition grounds. Thank you for that update, Stretch. Say, what kind of a name is that, anyway? Sounds English.